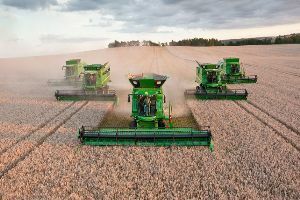 As demand for crops worldwide continues to grow, agricultural growth in the state of Indiana will likely be sustained. According to recent research findings (PDF) from the Indiana Business Research Center (IBRC), Indiana’s agricultural industries contributed $37.9 billion in 2011 to the state’s economy, much in part directly related to crop production and processing. The results show agricultural output in Indiana supports nearly 190,000 jobs, of those jobs, a reported 103,000 are directly involved in crop production and processing. Tanya Hall, an economic research analyst at the IBRC says, "The pastoral scenes along Indiana highways are more than just fields of corn and soybeans or barns of hogs and chickens. Those scenes represent the livelihoods of some 190,000 Hoosiers." In fact, according to the research, approximately 83% of Indiana’s geography is currently devoted to farming or forests. The Hoosier state commodities with the highest production value were grains such as non-silage corn, oats and wheat, with a total value of $13.9 billion. Soybeans were valued at $2.8 billion. Farming of these crops specifically were responsible for more than half (54,000) of all agricultural jobs in the state. This research shows the agricultural industry in the Hoosier state is a very important piece of the state’s economy and crop production is a key component.